Ann Trow was born in Paineswick, Gloucestershire, England in 1812 to an impoverished family. While still a girl she became a servant in a butcher's family, then married a tailor named Henry Somers. The couple immigrated to New York where Somers, "a habitual drunkard," according to The New York Times decades later, died leaving Ann to raise their daughter alone. She made her living as a seamstress, then married a struggling printer, Charles R. Lohman. At the time the plight of many poverty-stricken women who became pregnant was dismal at best. Many newborns were abandoned by parents who either did not want them, or were unable to care for them. Called by the New-York Tribune the "step-children of Nature," 78 percent perished. Desperate women, too, died at the hands of clumsy abortionists. Ann responded to the need, as well as to her own financial problems, by reinventing herself in 1836 as a midwife, Madam Restell. While she did assist in births, her main income came from what The New York Times would call "the pill and powder business"--birth control. Charles followed her lead, taking the name Dr. Mauriceau. In 1840 they moved to No. 146 Greenwich Street. "Preventative Powders," for married ladies, whose delicate or precarious health forbids a too rapid increase of family, will be sent by mail to any part of the United States. Price $5 a package. 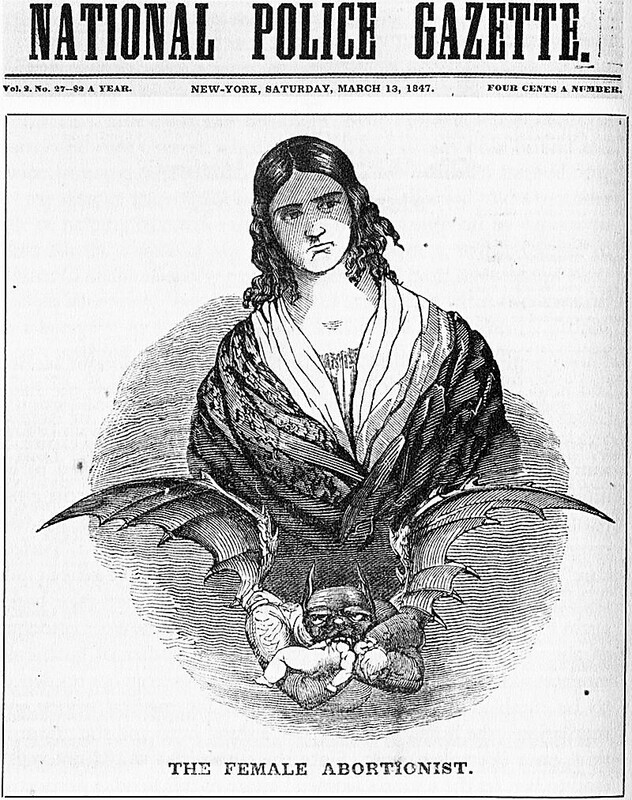 Birth control was both illegal and immoral in Victorian New York. But private need outweighed public righteousness and the couple's business thrived. The $5 package price would be about $155 today. But, according to The Times, "their notoriety kept pace with their prosperity." While she was there, Charles remained busy. In 1847 he published the ungainly-titled The Married Woman's Private Medical Companion, Embracing the Treatment of Menstruation, or Monthly Turns, During their Stoppage, Irregularity, or Entire Suppression, Pregnancy, and How it May be Determined. Shockingly, it openly advocated birth control and abortion and pushed his "Portuguese Female Pills." But like his wife, he was careful to present the pitch as medical help. The pills would "undoubtedly, even produce miscarriage" when problems like the malformation of the pelvis made birth dangerous. 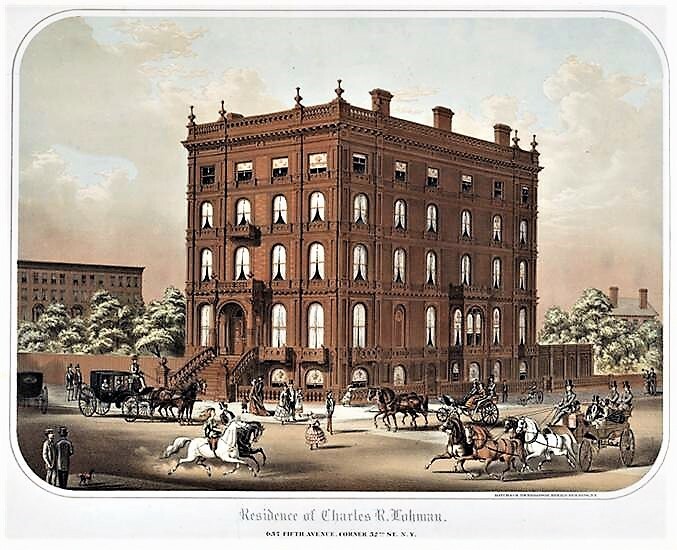 In 1850 the Lohmans moved to a fine home on Chambers Street. The Times later recalled "She there occupied a handsome house, sumptuously furnished, drove fast horses, kept many servants, and exhibited herself in public so boldly as to excite general disgust." 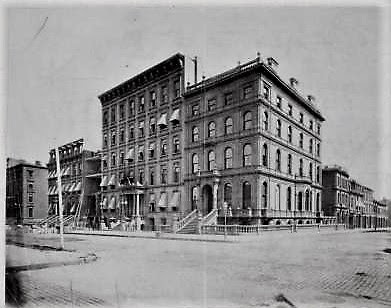 By 1863 the couple's wealth was so vast that they began construction on a lavish mansion at the northeast corner of Fifth Avenue and 52nd Street. At the time there was little development--Fifth Avenue this far north would not be paved for nearly two decades. The Lohmans' seemingly self-imposed isolation (their only neighbor was the Roman Catholic Orphan Asylum in the block directly to the south) may simply have been an issue of practicality. No one in polite society would abide them as neighbors. Completed in 1865, the massive brick and brownstone house diminished almost all of the mansions of Manhattan's wealthiest citizens. A broad stone staircase led to the entrance portico. Multiple balconies clung to the facade and the roof line was crowned with a regal balustrade with giant finials. To the north was a sprawling walled garden. The Times later described the house in unkind terms. "It was furnished throughout in an extravagantly rich and vulgar style, the window shades, covered with gaudy flowers, making the house one of the most conspicuous on Fifth-avenue." A gate in the side wall led to Ann's office. 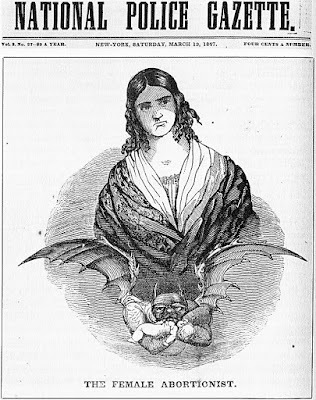 An advertisement in The New York Herald on May 28, 1867 read "Madame Restelle--Professor of Midwifery over thirty years, guarantees immediate relief to every lady requiring medical or surgical treatments, from whatever cause. Office No. 1 East Fifty-second street, first door from Fifth avenue." At the same time, "Dr. A. M. Mauriceau" ran daily ads for "A great and Sure Remedy for Married Ladies" in the same newspaper. They promised that the Portuguese Female Pills "always give immediate relief." On August 23, 1871 The New York Times called the ads "these shameful notices" and claimed that "nearly $60,000 per annum is invested by this couple in advertising." The newspaper sent two undercover reporters--a man and a woman--in an attempt to get damning evidence that Ann was an abortionist. They explained their desperate situation; but Ann was wary. "I can sell you some pills, but really we do no other business. We have had so much trouble about these matters we don't take any more risks. In all the six years that we have lived in this house there has never a stranger slept under the roof--none in fact but our own family," she told them. The family members to whom Ann referred were her grandson, Charles R. Purdy, her granddaughter Caroline and her husband R. H. Shannon. Ann's daughter had been married to a man named Purdy (a relative of Ann's attorney, Ambrose H. Purdy). Following his death she married a policeman named Farrell against Ann's wishes. Ann never truly reconciled with her daughter, refusing to recognize either her or her husband. She adored her grandchildren, however, and convinced her daughter to transfer custody to her. Ann allowed Caroline to visit her mother, but refused to allow her carriage to be seen in front of the house. The Times said "Mrs. Farrell was visited by her daughter frequently, the latter blazing with diamonds, driving in the splendid carriage of her grandmother to the corner of Varick and Carmine streets, walking thence to the humble abode of her parents on Houston-street." Ann was not heartless, nonetheless. She paid for the Farrells' house and frequently took care of the past-due bills of their butcher, grocer and such. As the mansions of New York's best families inched up Fifth Avenue, Ann attempted to sell the plots that made up her garden. The Times said later "It is said that she made efforts to sell the lots adjoining her house on Fifth-avenue, but could find no purchaser who cared to build in her neighborhood." Frustrated, she erected the Osborn apartment house on the site in 1876. Two years later The Times said "The "Osborn" was for a long time an unproductive investment, and the aversion of Mme. Restell was so great that even when the rents were reduced 50 per cent, it was difficult to get tenants." Charles R. Lohman died on January 5, 1877. One year to the day later Ann found herself in deep trouble. Anthony Comstock, the founder of the Society for the Suppression of Vice, was indefatigable in his crusade against perceived immorality. On January 28, 1878 he visited Ann's office in disguise and became "convinced that she was still engaged in her nefarious practices," according to newspapers. He made a complaint charging her "with selling and having in her possession certain instruments and medicines." In reporting on her arrest, The Times mentioned the house. "It is one of the finest in the City, and never fails to attract the attention of the passer-by, on account of its architectural beauty and magnificence." The article added that Ann's fortune, estimated "to be not less than $1,500,000" was "entirely the proceeds of her criminal profession." It, perhaps unintentionally, revealed the hypocrisy of Victorian morality. "Her patrons are said to belong to belong to the very wealthiest families." In fact, it appears that Ann Trow Lohman truly felt she was doing good (as did another of Comstock's targets, Margaret Sanger, who is positively viewed today as a pioneer in birth control.) Ann pleaded with the Judge Kilbreth to be released on bail. "She urged that she had several ladies belonging to good families under her charge; that they needed her personal care, and that her enforced absence would place them in great danger," reported The Times. On February 27, 1878, the second day of the trial, Ann sat in the courtroom behind a veil. She was forced to listen to Assistant District Attorney Herring's condemnations. He said, for instance, that she had established "a maelstrom of hell" and organized "a business of such a nefarious character that it seems to have tainted the whole atmosphere with evil within the precinct." Although Ann maintained a composed presence in court, she was seriously traumatized by the publicity and trial. Caroline's husband told a reporter that "All day Sunday [March 31, 1878] she rambled restless about the house, talking pitifully about what she called the persecution she was undergoing." He said she repeatedly wrung her hands, saying "What shall I do? What shall I do?" and "I have never injured anybody; why should they bring this trouble upon me?" She went to bed at around 9:00 that evening, having said she could not bear to appear in court again the next day. The following morning a chamber maid, Maggie McGrath, noticed the door of a bathroom on the second floor was open as she headed downstairs around 7:00. She could see a nightdress thrown over a chair and assumed Ann was taking a bath. Around an hour later, having had breakfast, Maggie went upstairs again. She was surprised to see the door still open and the nightgown still on the chair. The Lohman mansion had the latest in luxuries and conveniences, including the wood-encased bathtub with wooden folding doors for privacy. According to The Times, when Ann did not respond to her voice, Maggie opened the doors, "uncovering a spectacle that curdled her blood and sent her screaming with horror from the room." The notorious Mme. Restell is dead. Having for nearly 40 years been before the public as a woman who was growing rich by the practice of a nefarious business; having once served an imprisonment for criminal malpractice; having ostentatiously flaunted her wealth before the community and made an attractive part of the finest avenue in the City odious by her constant presence, she yesterday, driven to desperation at last by the public opinion she had so long defied, came to a violent end by cutting her throat from ear to ear." Ann was buried next to Charles in the Sleepy Hollow Cemetery in Tarrytown. The hurried funeral the following morning "was a private, unostentatious and unchristian as possible," according to The Times. Ann had been placed in a simple rosewood coffin the night before and was placed in the reception room. Just before the hearse arrived, the servants were called in for a last look at their mistress. Ann's children and grandchildren followed them in a short line around the coffin. There was no religious service and, according to The Times, "the casket was carried to the hearse and fastened in without any acknowledgement of a future life." With the infamous Madam Restell gone, reputable families felt comfortable moving in to the neighborhood. In 1882 the Vanderbilts completed construction on their massive mansions directly across the street. Ann left her entire estate to her grandchildren, leaving her daughter with nothing. They combined No. 657 Fifth Avenue with the Osborn in 1883, creating the Langham Hotel. The family retained ownership until 1902. 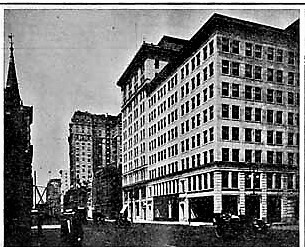 On July 15, 1911 the Real Estate Record & Builders' Guide reported on "Loft Buildings Among the Mansions," and noted that a "purely loft structure" was rising "on the site of the old Langham Hotel." Completed in 1912, it survives. I am told that the restaurant La Grenouille occupies what had been Mme. Restell’s stables. Don’t know if that story is apocryphal. And although off topic for this forum, i have often wondered if the pills and potions sold by Mme. Restell and her husband were at all effective or if the pair were simply highly effective “snake oil” salesmen?